We all know kids are seriously picky eaters. Averi wouldn’t eat anything that had a sauce on it for a really long time. Which made me super sad because I had been looking forward to eating her leftover macaroni and cheese since I had become pregnant with her. Then we moved to Miami. And her friends here took pickiness to a whole new level. Except I soon realized they weren’t being picky. They were just being what they were – the children of native Brazilians. Argentinians. Cubans. Venezuelans. Who all still ate as if they were in Brazil, Argentina, Cuba or Venezuela. Which means the kids weren’t eating peanut butter and jelly sandwiches. Or cheeseburgers. Or tuna salad. And listen to read this! One friend came over after school on a rainy day for a play date, and I texted her mom to see if she would mind if I gave the girls some hot chocolate. Because to Averi, rainy days = hot chocolate. Her mom said I could, but she’d never had any, so she may not like it! Can you believe!? Five years old and she had never tried hot chocolate. To my knowledge she still hasn’t, as I decided to not give them any. I only had instant and I didn’t want that to be her first experience with hot chocolate. Especially since I didn’t have any marshmallows or whip cream to improve it with. I will have her over another time, where I will make proper hot chocolate for her. Melting my own chocolate. And enhancing the adult’s with peppermint schnapps and the kids with marshmallows. And speaking of marshmallows. 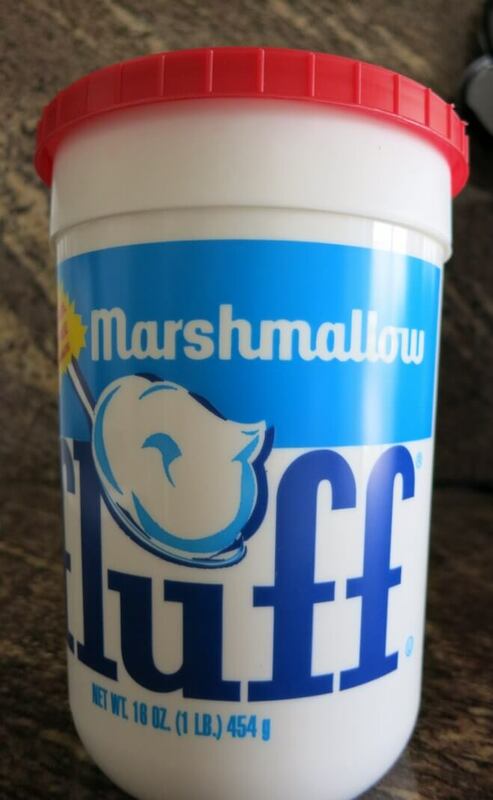 The other day, a friend and I were talking about something, and for reasons I now can’t remember, I felt the need to mention marshmallow fluff. 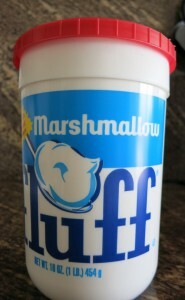 My friend, who is Argentinian, had never heard of marshmallow fluff. In the words of the great Vizzini, inconceivable! Luckily, we had already been invited over to her house for a BBQ tonight. And even though she told me not to bring anything, I am. 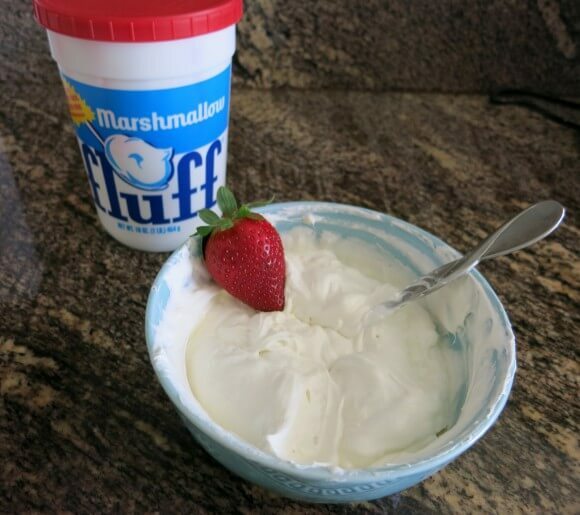 Partly because of my need to feed everyone, partly because my mother raised me to not show up empty handed, but mainly because I feel that my friend needs to enjoy some marshmallow fluff. Today I went with a great fruit dip that an old coworker of mine brought one time for a potluck. 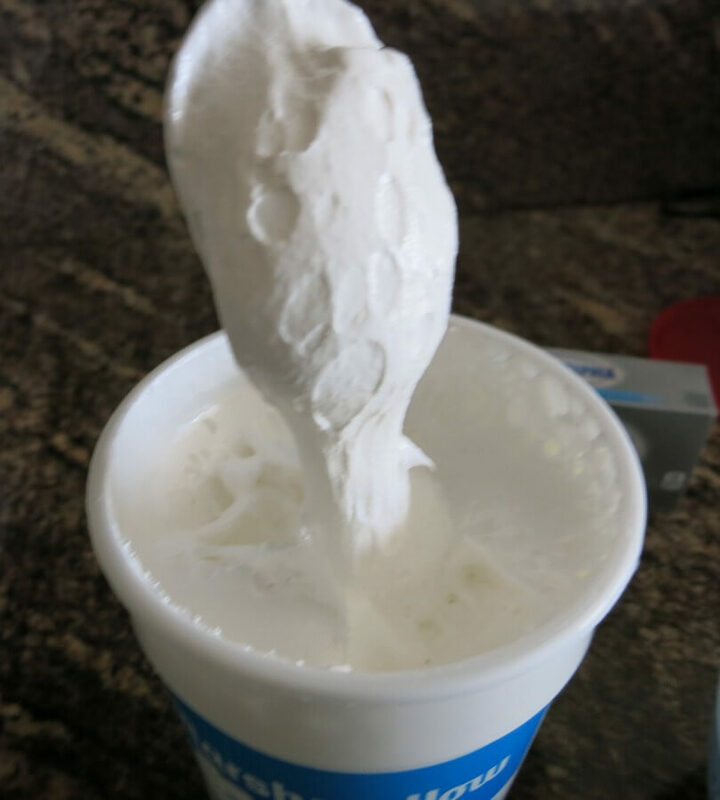 It is just fluff and cream cheese mixed together, and it is delicious. It is light and sweet on its own, but there are numerous ways to alter it, depending on your personal taste and what you will be dipping with. Combine the cream cheese and marshmallow fluff. Begin enjoying immediately.